Michael Lira spent a memorable day at Daytona International Speedway as a volunteer for the Department of Children and Families (DCF) Foster Day Camp, speaking to students from the DCF Youth Program about the life of a young professional racer. The chance to give back to the community, especially young people, is something that is very special to me. “DCF at DIS” treats young foster students to a full day at Daytona International Speedway, where they get a behind-the-scenes look at race operations on one of the world’s most famous superspeedways and get to meet some of the professional drivers. In addition to being a professional race car driver in the ARCA Racing Series, Lira is a model student himself. The seventeen year old from Port Orange, Florida, is a student in the prestigious International Baccalaureate Program at Spruce Creek High School, and is also the #1 ranked high school trombone player in the state. Lira’s station, one of many stops on the students’ tour around the track, was located in the inspection bay near the pit road entrance, where race teams must bring their cars to ensure that all of their parts are legal on race weekend. The 25 students, all between the ages of 10 and 17, huddled around Lira’s Pro Late Model race car to hear him speak while he explained the inspection process and told them a little bit about himself and how he got started as a professional race car driver. With the help of one of the students, Lira popped the hood off of his No. 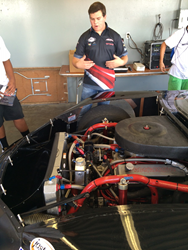 57 Pro Late Model Ford Mustang and gave the students a look under the hood. He pointed out the different engine components and explained in detail what each part does. Lira then climbed through the window into the driver’s seat, demonstrating how he gets in and out of the car without the use of a door. Lira ended his time with the students by posing for photographs and signing an autograph for each of them. Lira now turns his attention back to racing, as he heads to Pocono Raceway this weekend for perhaps the biggest challenge of his ARCA Racing Series career. The 2.5-mile “Tricky Triangle” will be the longest and fastest track that Lira has ever competed on. The ModSpace 125 at Pocono Raceway is scheduled for August 1, 2014, at 5:15 p.m. EDT and will air live on Fox Sports 1. To keep up with all of the action, follow Michael Lira on Twitter at @LiraRacing and @1MichaelLira and on Facebook at /MichaelLiraRacingOfficial. Visit the official Michael Lira Racing team website at http://www.MichaelLiraRacing.com for the latest racing news and information.